Aigo/Paroit recently introduced their all new tablet, named Aigo N700.The new Aigo N700 tablet runs on Google Android 2.1 OS.Aigo N700 also is provided with supports for Flash 10.1 and MS Office.The new tablet can easily access to ebooks, online magazines, reads MS Office files, push email and stream video. The all new Aigo N700 tablet equips a 7 inch multi touch display with a resolution of 800 x 480 pixels and is powered with Dual core Cortex A9 1Ghz processor with 1MB L2 cache that provides high speed access.Aigo N700 tablet also includes a NVIDIA's Tegra 2 graphics chipset and a 512MB of DDR2 memory.The tablet is provided with a 1.3-megapixel camera and also a SIM card slot. Other features tha t comes housed with Aigo N700 tablet includes 4/16/32GB of inbuilt storage, a USB socket, microSD slot, HDMI output, WiFi, audio in / out and optional 3G WWAN.New Aigo N700 tablet also provides support for 1080p HD video playback.The tablet also includes a 3,120mAh battery. 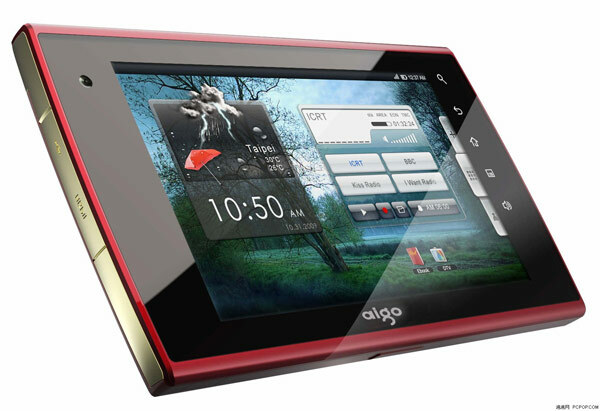 New Aigo N700 tablet also is provided with a built-in accelerometer for easily toggling the screen and ambient light sensor is also included.Details about availability and price are not revealed yet.. Tags:-aigo, AigoPad, Aigo N700 tablet features, Aigo N700 tablet details, Aigo N700 tablet specifications, Aigo N700 tablet images, Aigo N700 tablet specs, android tablet, Android Tablets, Android Operating System Tablets,android 2.1, Android2.1, multitouch N700 slate, tablet, tegra 2 tablet pc, TabletPc tegra.